No matter what the weather may be throwing at us, I am d-o-n-e with winter. I’m ignoring the cold, gloomy, gray and dreary days outdoors and am gettin’ my spring on! I starting out in my farmhouse breakfast area, where the sun finally came out today and was pouring into the room. Such a treat after all of the gloom and rain. Before I go any further, let me say how thrilled I am to be joining the talented group of ladies who’ve been bringing you Farmhouse Friday once each month! I’m secretly a little intimidated (shhh – don’t tell! ), but am so honored to be joining in on the fun. 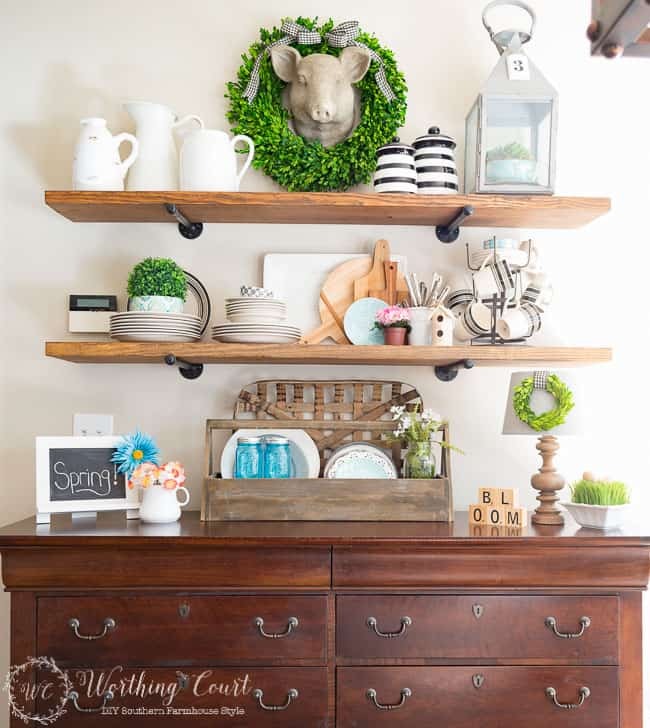 This month’s theme is Farmhouse Florals and you’ll find a link to everyone’s projects at the bottom of this post. Back to my breakfast area. I didn’t want to go overboard with adding flowers, so I just put a few small touches here and there – just enough to say ‘Welcome Spring!’. I’m notorious for not keeping up with the water for fresh flowers, so faux it is for me. 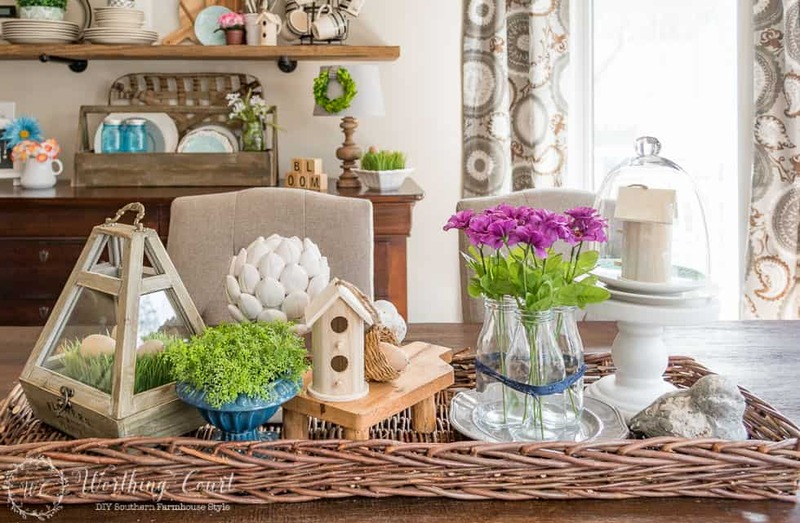 My kitchen table centerpiece only has one small grouping of flowers in it, but there are plenty of other elements that speak to spring too. If you follow me on Instagram (I’d love to have you join me – you can do that HERE), you already gotten a peek of it. 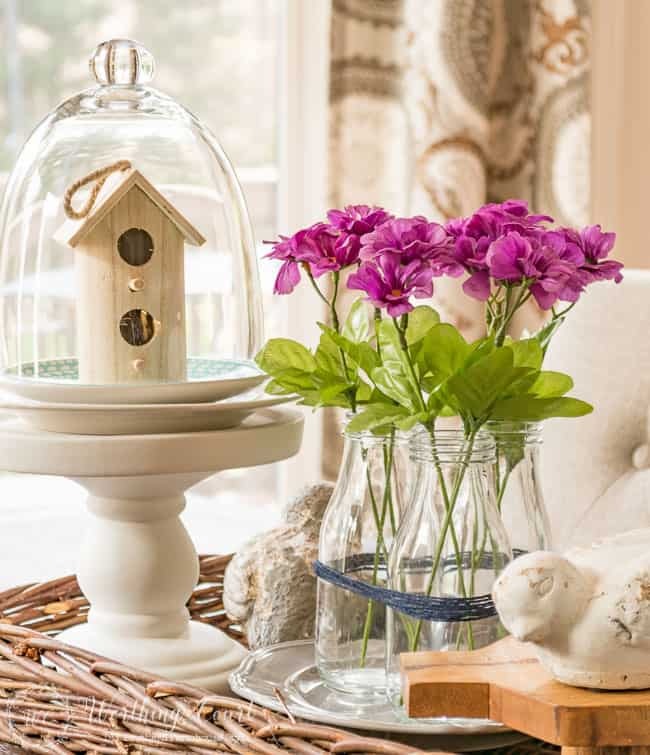 Simple sprigs of dollar store flowers fill three glass jars. The grouping is made a little more noticeable by tying the bottles together with a bit of colored twine. That little white bird looks like he photo bombed my picture! 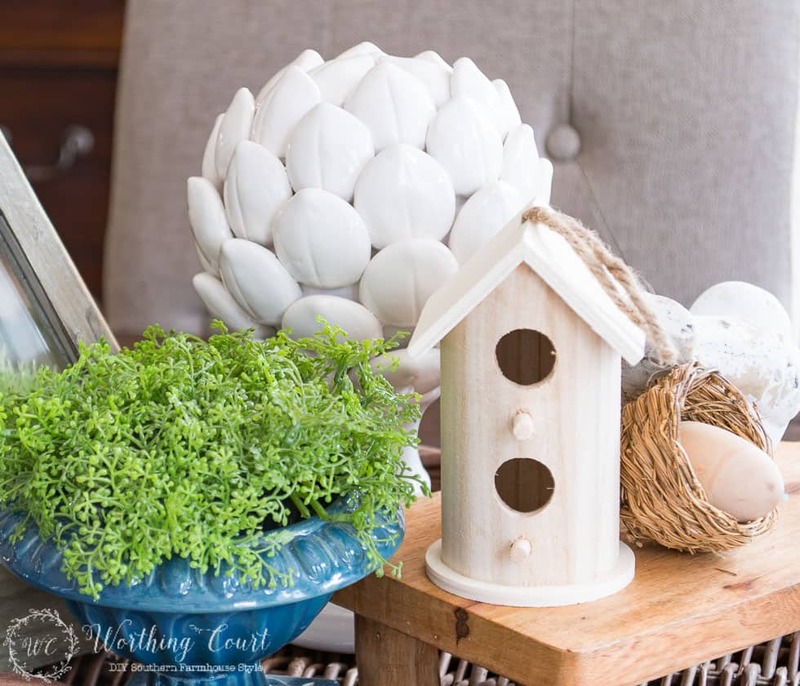 I picked up several of these cute little birdhouses at Michael’s the other day for only $1. I left them unpainted because I really like the natural color of the wood. 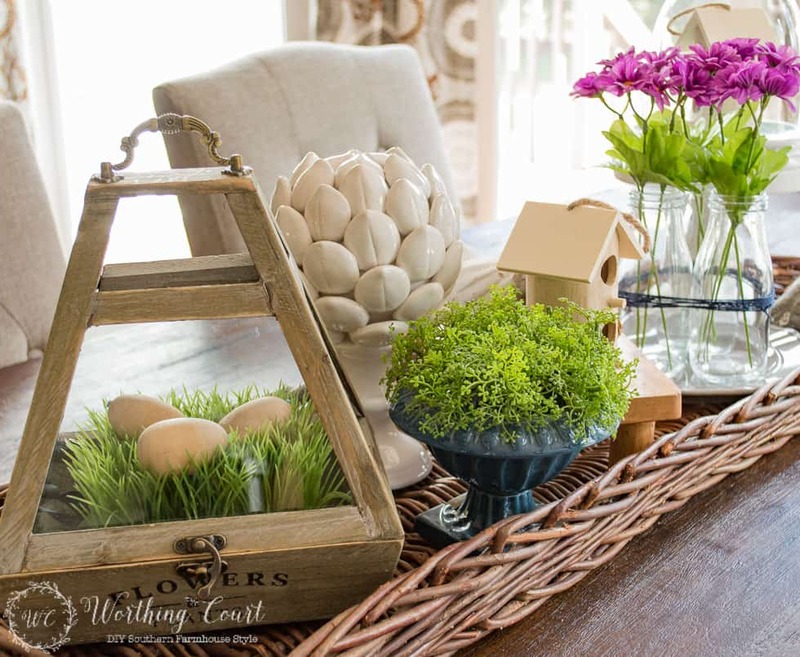 The other end of the centerpiece is filled out with another Michael’s purchase – a terrarium filled with faux grass and some eggs. Easter is just around the corner, ya know. I know that putting together a centerpiece can seem intimidating sometimes. My best suggestion is to wait until you’re in the right frame of mind, pull out all of your stuff, dive right in and play away! I wound up using only a small fraction of the stuff that I actually pulled out of my stash. 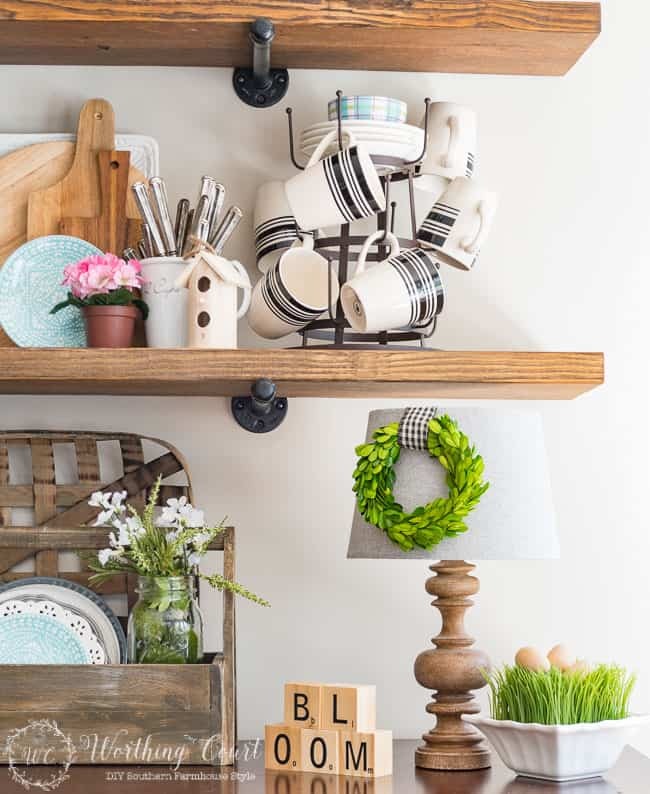 Over on the open shelves, I only switched out a few of the items to give them some spring fling. I took it easy on the florals on the shelves too, so as not to overdo a good thing. A couple of bunches of sweet daffodils from the dollar store fill a little country pitcher. The stacked black and white plates and bowls (from the dollar store) remained. An added easel chalkboard with a clip-on flower completes this spot. The other end of the sideboard/dresser/linen storage is still sporting my little lamp that stays on 24/7. But, I added cute letter blocks (another Michael’s purchase) to spell out BLOOM, and a bowl of faux grass sporting more wooden eggs. One more of the little birdhouses made its way to the shelves too. I kept the reproduction toolbox in its spot, but I switched out a few of the plates, added a few blue touches and a mason jar filled with, you guessed it, more dollar store faux flowers. 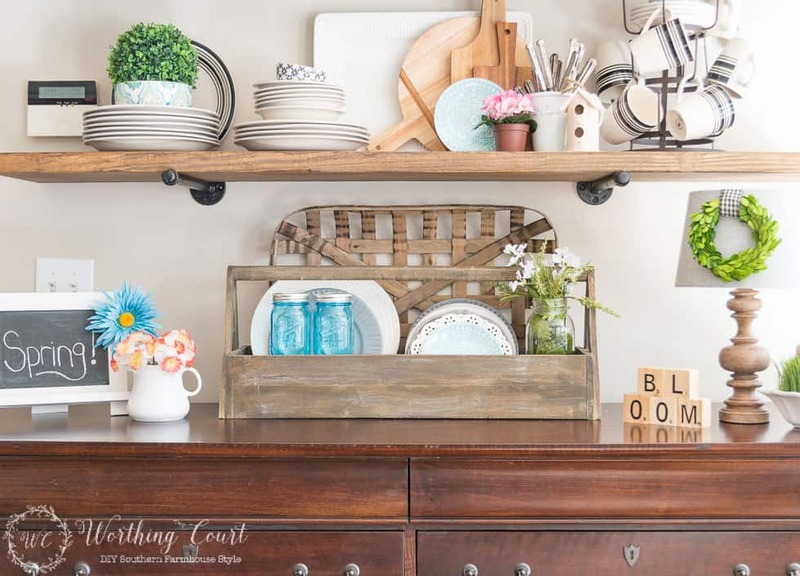 Thank you for stopping by my farmhouse kitchen today! 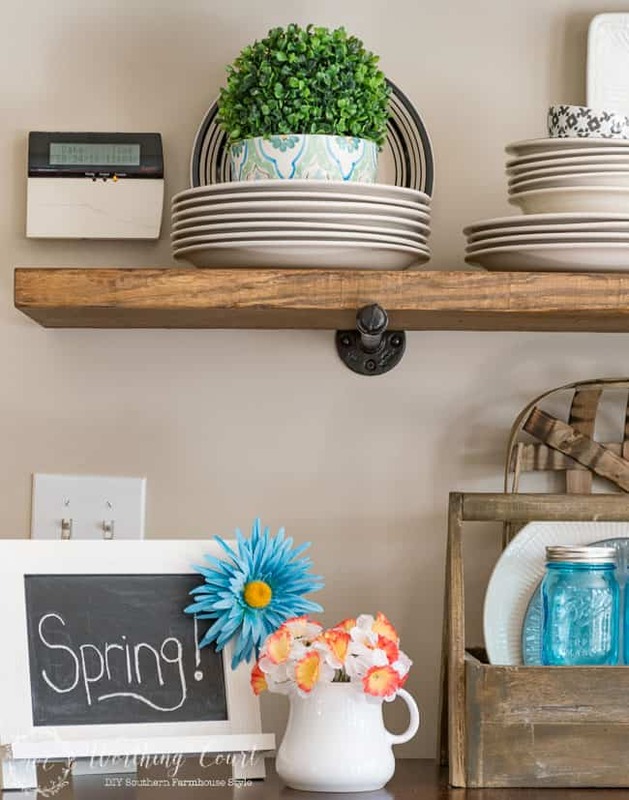 Have you started decorating for spring? Don’t miss the other fabulous projects! 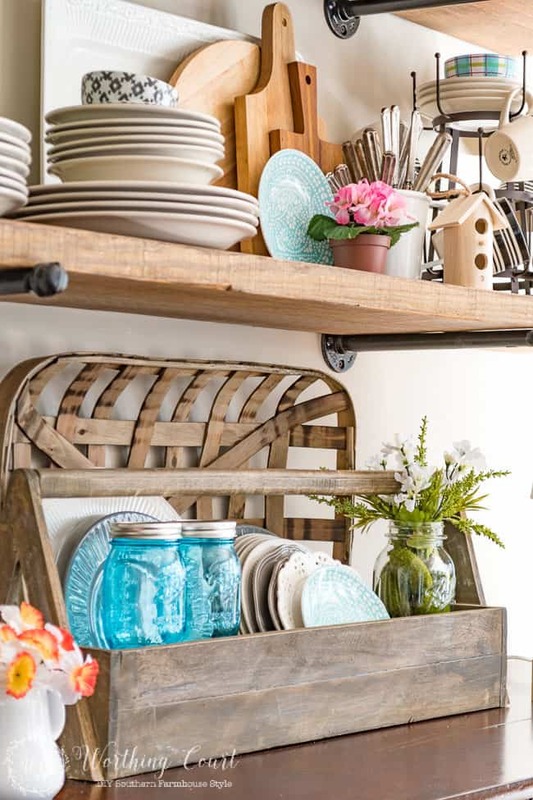 Every time I see those shelves I want to run out to the hardware store! I love those things! 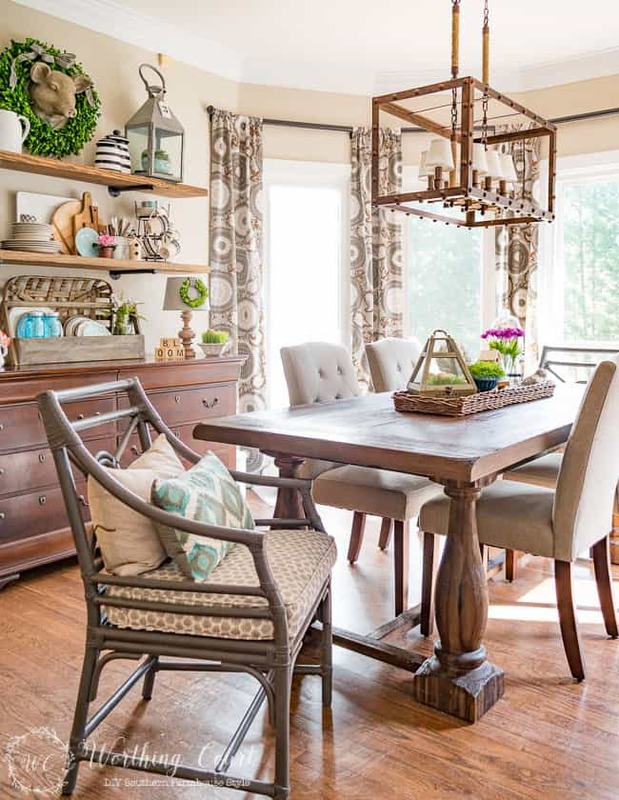 Your dining room is gorgeous, Suzy! So glad to have you join us for Farmhouse Friday! Suzy, a big KUDOS to you! 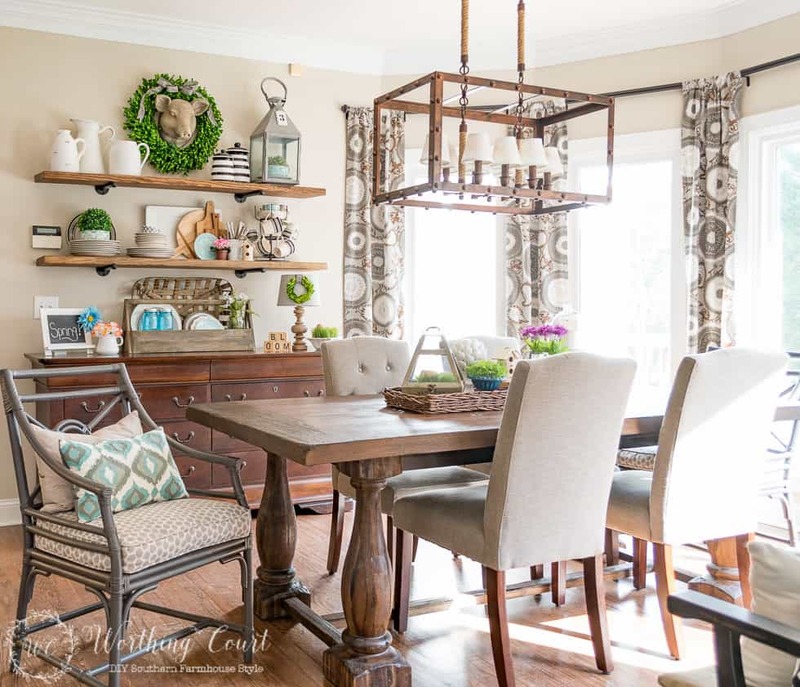 Your dining room is just stunning and so fresh and updated!!! It does spring beautifully! So happy to have you as a FARMHOUSE GAL! Your room is gorgeous! I love the huge basket filled with all those lovely bits!! So much inspiration in this post!! In fact, I just sent a picture of your gorgeous shelves to my husband. They are just perfect. Love arrangement in the basket on the table too. Actually, I love it all. So glad to be sharing Farmhouse Fridays with you. I LOVE those adorable little birdhouses. Must see if my Michaels has those. What a cute, understated little touch they add. So clever of you to see their potential. And I am made about your IKAT pillow in the chair. This is really gorgeous, Suzy! Your room is beautiful! Beautiful! I can’t believe there are so many dollar store finds.. I never have luck there but I probably just need to get more creative. 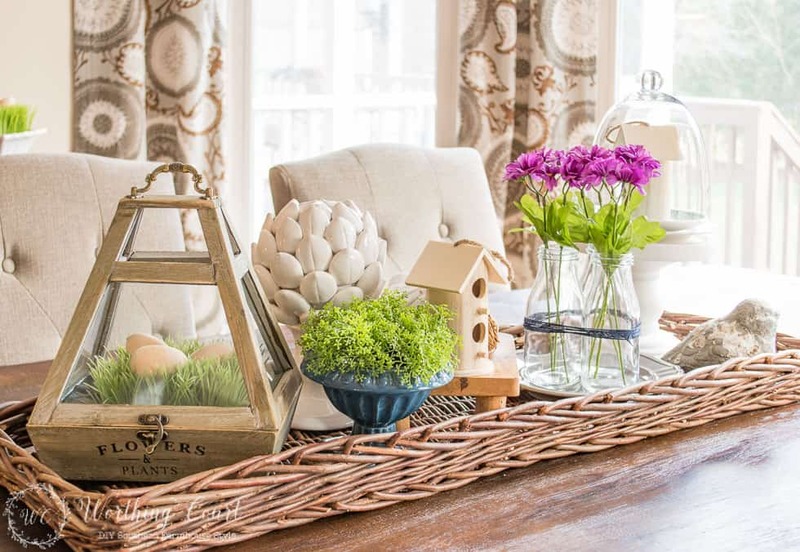 Your dining room is so lovely………..and really enjoyed your centerpiece vignette, so Springy and perfect for your table. Enjoy all that beauty you have created. Have a fun weekend. I love the ladder you made! And I especially love the dining room light fixture. I Washington wondering if you have a tutorial for the reproduction toolbox. Hi Christiane. I’m afraid that I didn’t make that toolbox. I picked it up at a local home decor store a few years ago.